England crashed to one of their most ignominious cricketing defeats of all time, as the Netherlands won the ICC World Twenty20 curtain-raiser at Lord's by scoring two runs off the final ball amid scenes of scarcely believable drama. Chasing a target of 163, which would have been much higher had England batted with any conviction in the second half of their innings, the Dutch stayed up with the required run-rate throughout. Tom de Grooth's 30-ball innings of 49 was the chief catalyst to a famous victory, and the sheer adventure shown by the Dutch was best exemplified by the four sixes they hit. England had failed to hit a single one. 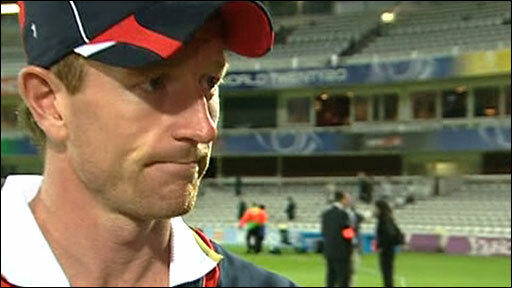 All the same, Stuart Broad could have stolen a win for England right at the end. The last ball was bowled at the Netherlands' number eight, Edgar Schiferli, who barely managed to get a bat on it. Broad, as he had with most of the balls in the over, picked up in his follow-through, but turned and missed with the attempted run-out, and the Dutch grabbed an extra run with the overthrow. Had the bowler chosen to keep the ball, and allow the single, the game would have been decided by a one-over eliminator. Bowling an unusual round-the-wicket angle, Broad bowled a series of yorkers at Schiferli and Ryan ten Doeschate. But somehow the two right-handers scampered singles off each of the first five balls and incredibly, there could have been a wicket from four of them. Broad spurned two run-out opportunities and James Foster one, while Broad also dropped a chance when Ten Doeschate drove a drive back above his head. While the recriminations will continue long after the dust has settled on this landmark result - England's only previous loss to an associate nation was against Zimbabwe in the 1992 World Cup, but they did not need to win that match - and, in truth, the night was as much about a brilliant team performance from the Dutch as the desperately lacklustre cricket England produced. After persistent rain during the day had caused a 20-minute delay, and severely curtailed the opening ceremony, England were put in to bat and raced to 100-0 from 11 overs thanks to Luke Wright (71) and Ravi Bopara (46). 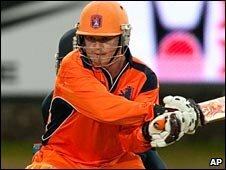 The Netherlands' trump card was Dirk Nannes, who has Indian Premier League experience, allied to spells with Victoria and Middlesex. But the left-arm paceman opened up with a nervous, low full toss, and the in-form Bopara stretched across to bounce it over point's head for four. Wright also hit his first ball for four, Schiferli drifting into the right-hander's pads to be guided past the short fine-leg. Bopara was by far the most composed of the two batsmen, effortlessly square-driving Ten Doeschate in his Essex team-mate's first over. Wright, who failed to time the ball as sweetly, nevertheless continued to add to the barrage of runs. But eventually, Bopara skied Ten Doeschate to wide long-on, and England, who brought in Rob Key for the injured Kevin Pietersen, barely did anything right for the rest of the match. Owais Shah drilled Schiferli to deep square-leg, then Eoin Morgan reverse-swept Borren to backward point. Swann has been one of England's best bowlers this year - how did he lose his place in the side to Adil Rashid? Embarrassingly, the last two overs yielded just 13 runs after Wright and captain Paul Collingwood had perished to catches in the deep, leaving Foster and Key to scramble singles in some desperation. Of the five Dutch bowlers used, only Nannes failed to take a wicket, while none got the punishment they might have feared. Though the Netherlands' run chase began poorly, Alexei Kervezee chipping James Anderson to mid-on in an over costing just two, it soon got some much-needed rocket fuel with a couple of sixes from the beefy Darron Reekers. 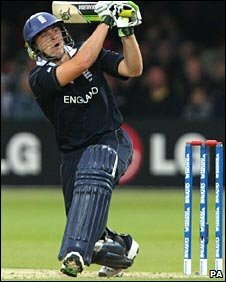 First, he pulled Ryan Sidebottom for a majestic maximum before using effortless timing to send Anderson over the ropes at square leg. England must have thought they could breathe more easily when Broad had him caught at mid-wicket. But by now, the Dutch were up with the required rate and a splendid innings from De Grooth reduced the hosts to quivering wrecks. The 30-year-old right-hander produced the innings of his life. He followed up a straight six off Broad with a reverse sweep for four in Adil Rashid's first over. Wright and Collingwood were also calmly despatched for De Grooth boundaries, all of which made Foster's stumping of Bas Zuiderent slightly irrelevant. The excitable tension that was sweeping through the 1,000 or so Dutch fans in the Mound Stand was converted into belief that something remarkable might happen when Peter Borren hit Collingwood into the top tier of the Grandstand. Finally, from the last ball of the 13th over, De Grooth's drive off Collingwood caught a leading edge and looped invitingly to extra cover. But with 47 needed from the last 42 balls, the Dutch were favourites, especially with the accomplished Ten Doeschate at the crease. England dug deep. Their ground-fielding remained nervous, as run-out chances were squandered, but for the time being their catching did not. However, with little more than singles needed, the Dutch continued to go for glorious boundaries, and that gave England a chance. Borren skied a pull shot, Daan van Bunge speared a catch to deep point and with 16 wanted from the last 10 balls England were back in it. At that precise moment, Ten Doeschate launched a Sidebottom full toss into the off-side, and Morgan, diving at full length in front of the Dutch fans, dropped a tough chance and parried the ball over the ropes for four. Though Broad then had his chances to save England's blushes at the death, by then the Dutch would not have deserved to lose. By some margin, this was their most significant cricketing victory. And boy did they look like they wanted to celebrate it as they sprinted towards their fans at the end.